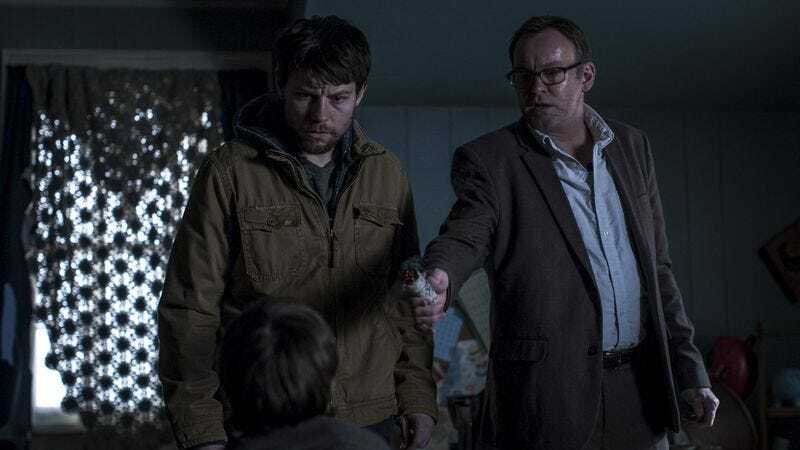 After watching the series premiere of Outcast, the latest comic-to-TV adaptation from Robert Kirkman, there’s certainly an urge to use the show’s goriest, most frightening scenes to describe what this show is and what it could be. After all, much like The Walking Dead, Outcast delivers its creepiness and violence immediately. A child watches a bug crawl on his bedroom wall before smashing his face into the wall and eating the bug; blood, spit, and guts drip down his face from the impact. It’s a shocking first scene, thanks in part to the slowly building score, and “A Darkness Surrounds Him” ups the ante immediately, as that boy, Joshua, makes his way downstairs to horrify his mother by biting his finger off. Make no mistake about it, Outcast is a horror show; if kids doing Demon Yoga poses isn’t your thing, you’re going to end up looking away a lot. “A Darkness Surrounds Him” has no shortage of intense moments that are familiar to just about any supernatural possession story, from levitating children to deep, growling voices that promise impending doom, and yet these moments aren’t used as cheap shock or gory decoration. Rather, they’re used to complement the more existential terror that permeates the premiere. What makes “A Darkness Surrounds Him” such a compelling and promising premiere is the fact that the dramatic storytelling is balanced with the more horrific elements. This is a show about demons and monsters, but it’s more about Kyle’s mental state, and the ghosts (physical and metaphorical) that haunt Rome and the people that reside there, meaning that we get little snapshots of what everyone is hiding. We get a peak into the life of Reverend Anderson, who plays poker with the local police chief (you’re always welcome on my screen, Reg E. Cathey) and specializes in demonic possession, and also get a snapshot of Kyle’s neighbor, who lets him borrow his car for the day. These are small moments, but they contribute to giving Outcast a lived-in feeling from the get-go. “A Darkness Surrounds Him” also succeeds by teasing just enough of the larger story arc while also making sure the premiere serves as an engaging one-off episode. So, over the course of the episode, we learn that these demons seem to be following Kyle, infecting every part of his life since he was a child. They came for his mother, they seemingly came for his wife—a brutal flashback revealing this information closes out the episode—and now they’re perhaps coming for him. What’s interesting is the way Kyle confronts these demons. Outcast doesn’t waste time on whether or not the supernatural forces are real, and that turns out to be a smart move, as it ushers in the action and inserts us right into the meat of the story. Thus, when Kyle visits the boy with Reverend Anderson and sees that he truly is possessed, there isn’t a sense of disbelief slowing the narrative down. Instead, Kyle uses his past experience to help exorcise the demon, hitting the boy and forcing him into the light. All of this is to say that “A Darkness Surrounds Him” is one of the more promising TV debuts of the year because it wastes no time establishing its world, characters, and themes. As Alex McCown mentions in his pre-air review, the show boasts “structural consistency” from one episode to the next, rather than “the “movie-in-13-acts” structure that’s typical of too many shows, especially one’s native to streaming platforms. There’s a larger narrative teased in the premiere, with mention of some sort of supernatural “merger” and the connective thread that is Kyle Barnes and his inability to escape these monsters, but “A Darkness Surrounds Him” succeeds by simply embodying everything a series premiere should be. It takes a bit of time to set up the world and the tone, and then dives straight into the story, familiarizing us with the characters, Rome, and the way everything intersects. “A Darkness Surrounds Him” is tense, beautifully shot, and expertly paced, resulting in a very promising start to the latest genre fare from Cinemax. Welcome to weekly reviews of Outcast! It’s good to know all of us can cower in a corner together if need be. Also, be kind to your fellow commenters when discussing any plot points from the comic series that you think could be considered spoilers. Adam Wingard, who’s brought an inspired vision to films like The Guest and You’re Next, is the director here, and boy does he hit it out of the park with that first scene. Patrick Fugit’s performance looks good early on, embodying the broken, vulnerable, but also hardened nature of Kyle Barnes. One of the more intriguing threads hinted at is the connection between the Reverend and the Chief of police. Something tells me there’s a lot going on behind closed doors in Rome. I have a lot of faith in a show like this being on Cinemax, where genre fare like Banshee is given a long leash to execute its creative vision.